The plant tinctures used today are only initial substances of the genuine and ancient alchemistical essences. Only the elixirs prepared according to the teachings of Paracelsus contain all three healing powers of the plant – made from body, spirit and soul, or salt, sulphur and mercury. However, anyone can prepare such a plant essence by himself. The present desperate situation of the Public Health Care System also holds a great opportunity. We are almost forced to recollect our age-old knowledge of herbs, healing teas, herbal compresses and the high art of preparing healing herbs, which is called alchemy. We can prepare teas ourselves, but the same is also true for genuine alchemistical healing essences that can be used and prepared by everyone. These are not only inexpensive healing remedies, they are also – if prepared correctly – highly effective. Therefore, nothing prevents us from preparing simple remedies ourselves to take responsibility for our well-being and remain healthy. Even today, nature offers us an abundance of valuable healing herbs. One example is the dandelion. This “bothersome weed“, whose beautiful omnipresent blossoms are a delight to the eye in spring, can be used to extract an excellent bitter elixir that supports the gall bladder, the liver and the digestive tract. From the inconspicuous wild-growing elder, which is also very widespread, an excellent strengthening potion can be made to build up resistance and act as an anti-flu remedy. And from the nettles, everyone can prepare a remedy himself that supports the functioning of the kidneys and the bladder. We only have to learn again to appreciate and make use of the things that Mother Earth has bestowed on us in such abundance. With these simple healing plants there is no need to be afraid of making any mistake or even of poisoning oneself. Now and then we can find lurid articles in the press maintaining that one of these plants of folk medicine were dangerous or even cancer-causing. The most spectacular case was that of coltsfoot, which has been used ever since for treating diseases of the respiratory tract. Consequently, for many years only pharmacies were authorized to sell it because it had caused cancer in animal experiments. However, the details of these experiment was largely kept secret. In these experiments with rats, the rats first received coltsfoot that was mixed with their regular food. This amount was continually increased until it was about one fourth of the total feed and the rats simply refused to eat the feed any longer. Until then not a single rat had fallen ill! Measured by human standards, this would mean that we could eat heaps of coltsfoot. Subsequently, these poor animals were force-fed with even larger amounts of coltsfoot. Why should it come as a surprise that an animal falls ill with cancer under such circumstances? It took nevertheless many protests from biologists and physicians as well as a number of counter-expertises until coltsfoot was freed from the taint of being dangerous and cancer-causing. Some plants are caught in the crossfire of the critics after some of their single active ingredients have been isolated and used in a high concentration. This is no surprise to naturopaths, because, by isolating a substance, all the concomitant substances of the plants are missing that make them more compatible and even healthier for animals and humans. This perception has even spread to community of the vitamin manufacturers in the past years. For example, they now add so-called bio-flavonoids to vitamin C (as a synthetic ascorbic acid) and market it as an enormous improvement of its effectiveness. These bio-flavonoids, formerly called vitamin P, are mostly natural plant pigments from rose hip, buckthorn, acerola cherry, elderberry or other fruits. Doesn’t it make more sense to eat the complete fruit with its full content of vitamin C or to take a naturally dried concentrate such as buckthorn granulate? In ordinary plant extracts the healing powers of the body are missing, because the salts of the plant are not extracted. In the same way, important parts of the soul are lost, since the vacuum distillation of the plant, which is standard practice for the pharmaceutical industry, destroys a substantial part of those healing powers. This was confirmed by chemical analyses of echinacea preparations carried out by different manufacturers, which are used for the treatment of flu and for strengthening the immune system. When comparing a plant essence from a normal medicinal company with that from a naturopathic or anthroposophical manufacturer, the normal medicinal product contains definitely less active ingredients. Therefore, the usual plant extracts only contain a small portion of the salt, sulphur and mercury healing powers. Homoeopathic remedies, on the other hand, contain – as well as the essences prepared according to the simple method used to produce the Bach Flower remedies (instructions on how to prepare an alchemistic flower essence are given in the embedded text) – only the healing powers of the soul, the information of the plant. This is the reason why their energetic potential is not complete, because the parts of the body and soul, the sulphur- and mercury principle, are largely missing. 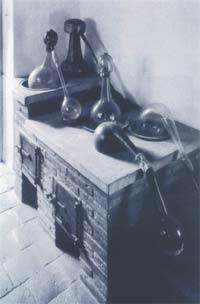 The sublime alchemistic healing remedies made from gems and metal such as the legendary gold essence “Aurum Potabile“ can only be produced with the help of certain secret solvents, the so-called “secret fires“.2 The extraction of a genuinely alchemistic plant essence is indeed less complicated. One only needs a good grappa, distilled water, an old pan or a wok and a means of distillation – either a table-top distiller, like the one used for the home-made brandy, a makeshift steam juicer or a small distillation apparatus with a heating pad (for the latter, the cost is approximately 200 Euro), a purchase that will quickly pay off, if used frequently. 150 grams of dandelion roots. Clean the roots of any leftover soil and dry the plants on a mat that is permeable to air such as a thin wicker basket in a warm and dry room, not in the blazing sun. Now place the leaves, blossoms and roots separately in a tight-fitting screw-cap container and add grappa so that all parts of the plant are covered. The grappa should have an alcohol content of at least 35 %; it is best to use an organic grappa (grappa is a spirit made from the skins and husks of pressed grapes). If you do not have a facility for drying the herbs, you can also place them directly into the containers together with the alcohol. Leave these three preparations in the alcohol for at least 28 days, respectively one moon phase. In an alchemistic laboratory, such preparations are usually swirled to the right every morning exactly at sunrise and to the left every evening at moonrise. However, it is also sufficient to swirl the containers from time to time in order to mix everything and moisten those parts of the plant that have not been covered with alcohol. In the next step, each of the three preparations is processed separately. Therefore one obtains three different distillates. Pour the now green coloured grappa in the distillation container and dilute the total quantity with one-third to one-half spring water. Then add the extracted parts of the plant and simmer all at a low temperature, so that the grappa bubbles only slightly. If the entire liquid has almost completely evaporated into the container, put the drained parts of the plant in an old pan (without teflon or similar coating). Close the distillate tightly. The drained parts of the plant from the distillation are now burnt to ashes outdoor on an old camping cooker or in a pan on a charcoal grill. In the beginning it produces a lot of smoke until almost all moisture is evaporated. It will take quite some time until the plant parts have turned into a white powder – so don't lose your patience. This white powder contains the salt of the plant, the saline healing principle. However, this salt must still be cleaned, as it may contain toxic elements of the plant. To do this, place the plant ashes in a container and pour some distilled water on it. Swirl everything and let the liquid stand for several hours. The soluble salts are dissolved in the distilled water, the insoluble residue (ashes) remain at the bottom. Now pour the ash water into a paper coffee filter or carefully pour off the top liquid. The insoluble toxic and waste products of the plant remain in the muddy ashes and will be thrown away afterwards. 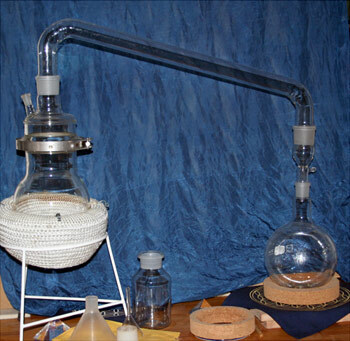 In an alchemistic laboratory the water with the soluble salts is usually evaporated and mixed with water several times, so that the salts are further purified. This is especially required when dealing with poisonous healing plants. With our simple dandelion essence, however, we can do without this exhaustive purification process. In the first step of unification, the three plant distillates are united with the respective soluble salt and distilled together once more. If you want the essence to be especially strong, you can once again add fresh parts of the plant. In an alchemistic laboratory the entire process is sometimes repeated four to five times or even more frequently. Once you have distilled the liquids from the dandelion leaves, the dandelion blossoms and the dandelion roots, you pour all three liquids together and make one last distillation. The last step in the production process is unfortunately often forgotten, although it can increase the energetic quality of the essence even further. Pour the liquid in a tall, spacious glass container that can be closed tightly and place it on the window sill. More and more liquid will volatilise in the sunlight, condense in the upper part of the container and run down along the inner wall – the liquid is thus circulating n the container. In this way, let the essence ripen for another moon phase, i.e. 28 days. By this process, the essence is filled with even more energy. In the alchemistic laboratory, the essence is purposefully exposed to the sunlight and the moonlight. Moreover, all production steps are carried out on the basis of certain planetary constellations, and the plants are being processed on the weekday which corresponds to the planet that matches the character of the plant – e.g. 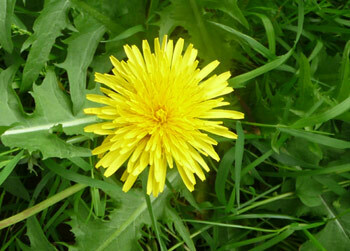 the mars-plant nettle on Tuesday, the elder on Wednesday (Mercury) and the dandelion on Thursday (Jupiter). Additionally, the distillation of the blossom preparations can also be accomplished on a Sunday. So you can carry out the distillation of the dandelion blossoms on Sunday and everything else on Thursday. The dandelion essence is now finished and can be used. If you have a plant preparation and not yet added further amounts, then take approximately 20–30 drops daily. When suffering from irregular digestion you can take 10 drops before every meal, otherwise in the evening before going to sleep. Since the liver and the gallbladder regenerate at night, this regeneration will be supported by the bitter constituents contained therein. Take the drops with some water or with a small sip of red wine, keep them in your mouth for a few seconds and then swallow. The following instructions can be used for all types of flower essences – here an example of an essence using pear tree blossoms, whose effectiveness has often been underestimated. The essence supports agitated people, helps with relaxation and meditation, gives power, protection, calm and balance. It can be used on a permanent basis by people born under a fire sign (Aries, Leo, Sagittarius) and by choleric persons in order to balance their fiery constitution. 1. Shortly before a spring full moon, pick 10–20 blossoms of an old domestic pear tree, put them in a crystal or glass dish and pour a mixture of water and some alcohol over it. 2. Place the dish in the sun for four days. Then drain the liquid using a filter and add the same amount of alcohol (e.g. grappa) for conservation. 3. Put the extracted blossoms in a fireproof dish and “roast” them to ashes using moderate heat – the so-called calcination. Place the ashes in a filter, pour distilled water over them and collect the liquid. The insoluble remains of the ashes will be re-heated and then poured over with water again. This process will be repeated three times. 4. Let the water with the flushed-out remains of the ashes stand covered for approximately two days and then carefully pour off the liquid. (Pour away the residue on the bottom.) The poured off water will slowly be evaporated with gentle heat until only the white salt crystals remain. 5. This salt will be poured over with the blossom water extracted in the sun, and then everything will be exposed to the sun again for one day. Take the bowl inside at about 5 p.m. and add again some alcohol. This spagyric flower essence contains – contrary to the known flower essences – the body (the salt), spirit and soul of the plant. "He who wants to cook must first learn to prepare the Chue. This poem written by the alchemist Alexander von Bernus (1880–1965) describes the seasoning concentrate for sauces and soups. In former times, people used to prepare it at home; nowadays it has almost been completely replaced by factory products such as broth and meat extracts and Maggi3. As von Bernus pointed out, the difference in taste, the nutritional value and energetic quality was very high and always justified the effort – especially since it can be prepared ahead and kept in the refrigerator. 1. Prepare a vegetarian broth. In order to do this, peas are cooked with water on a small “flame” for some minutes; then add celery, parsnip, leak, onion and some chervil, all cut into small pieces, and let it simmer (comparable to the alchemistic production process at body temperature that takes many days). After one hour at the earliest, let the pot cool down and let the viscous ingredients deposit at the bottom. The thin broth is poured carefully through a fine sieve. 2. Melt butter in a casserole, slice some onions and cover the pot with them. Put some carrots, parsnip, parsley roots, celery and leak in layers on the onions, all cut into small pieces, and season it with thyme; put fillets of carp or tench on top. Fry everything at low temperature, add some of the above mentioned broth and continue to simmer. Once the liquid has a strong brown colour, add the rest of the broth and let it boil up briskly. Then add a piece of parmesan cheese – and let it boil once more. Once a large part of the liquid is reduced, let the Chue cool down and pour it carefully through a fine sieve. The result is the Chue extract, which can be taken in spoonful doses as a seasoning base for sauces and soups. 3 “Maggi” is the brand name of a popular German seasoning sauce. It tastes like garden lovage.